Can you see the snowflakes in these photos? Look closely! It was a balmy 15F at this particular moment folks. Don't say I never suffered for my art. This is the Edda Shirt from Schnittmuster Berlin. 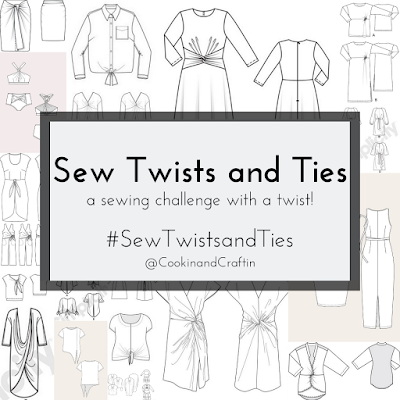 I'll admit I didn't know much about this pattern company, mostly because I don't speak German, until I fell down the rabbit hole of searching for twist and tie purposes for the Sew Twists and Ties challenge pattern round-up. Their Edda Shirt pattern is perfect for the challenge, though, and the language barrier the perfect challenge for me! Schnittmuster Berlin reached out to me and offered me a copy of the pattern for Sew Twists and Ties... I received the pattern for free, but all opinions are my own. Size-wise, I chose a size 48 based on my measurements. I wrapped the sleeve pieces around my biceps because they looked a bit slim to me, and I decided to do a 3/4" full bicep adjustment. I think I chose the right size overall, although I'm not super jazzed about the fit in the back. I gotta figure out those drag lines towards my armpits you see here... here, but also generally. Honestly, I don't feel my 3/4" full bicep adjustment was sufficient. The sleeves still feel pretty squeezy. It doesn't help that this not-quite-elbow-length, not-quite-short-length hits at the widest part of my bicep, which means the hem is always creeping towards the point of least resistance, my armpit. Hmmm. Next time I would widen them a bit more AND lengthen them to elbow length. On a positive note, I do feel like the Edda's high-neck shawl collar keeps it a bit more PG in the frontal region, even though the twist hits low. Unlike the Burda Style pattern Gillian made that required her to sew an additional 8" up for coverage, this one has plenty of coverage because the center front folds over into sort of a facing. I was able to understand the general construction of the Edda shirt pattern, despite my non-existent German skills, mostly because of my experience with other twist-y patterns, a hint of Google translate, the photo tutorial in the pattern itself, and the accompanying video for the burrito-style shawl collar. I'll did switch up the order of construction a bit as I went along, not without unpicking. I decided to sew one side of the collar onto the back neck before sewing the shoulders to get a smoother seam across the shoulders. I also sewed the sleeves in flat after figuring out all of the twist and collar bits, then sewed the side seams. I'll always avoid setting a sleeve if I can! Back to that shawl collar: the instructions, and video, show a tricky burrito-style method that I couldn't figure out without ending up with a Mobius strip. 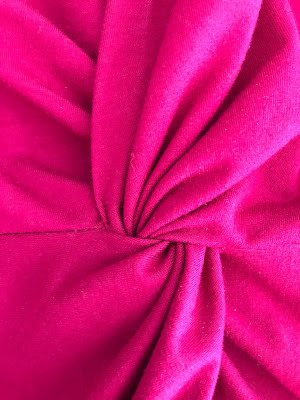 Instead I ended up folding the edge down and top-stitching it down along the back neck. By the way, my fabric is a thick cotton/Lycra jersey that I bought when I lived in Asia. Maybe in Hanoi? A stash mystery. I adore the color, but worry it may have been ever so slightly thick for this particular pattern. And yet perfect for Valentine's Day. So, after all that, I really like the front, twist part of the Edda, I just need to make some tweaks to the sleeves and fit in the back to make it a perfect 10 for me! Speaking of perfect 10s, I don't think my pairings here are a perfect 10. More like a weak 3. But I think the Edda would look lovely with a high-waisted pencil skirt, though. It's also a great pairing with my Helen's Closet Blackwood Cardigan, although that's not saying much, as the Blackwood goes with most things... Also, as an aside, can we talk about how big my bust looks in these photos?! Thank you, Schnittmuster Berlin for an exciting Sew Twists and Ties challenge. I love the twisty front and can't wait to make another one! Good timing! Half of Bangkok is wearing red for Chinese New Years. Year of the pig, apparently. Nice top! I think cherry red really suits you. Have you seen this pattern? Very nice! I can speak German, but I have never tried a German pattern, and am not sure I could effectively translate. You did very well with Google translator and your experience!! Beautiful shirt and the color is fantastic on you!